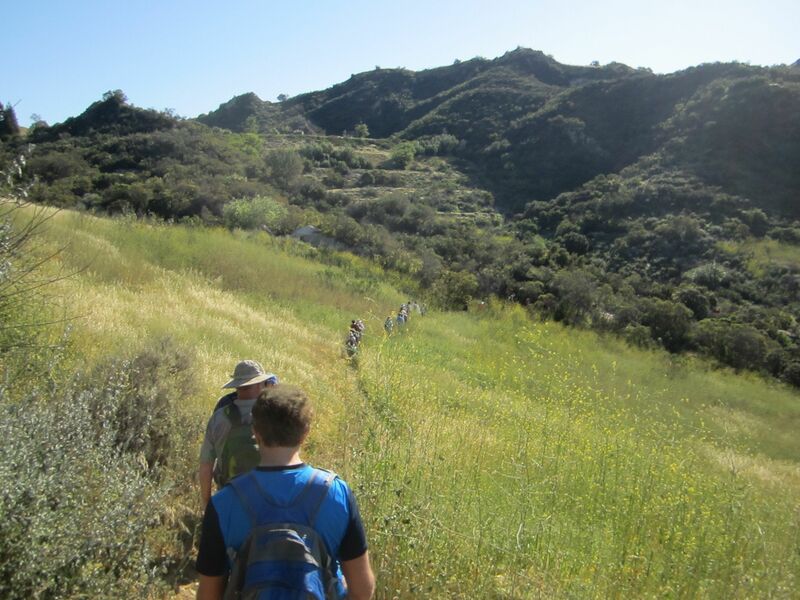 We’ll begin at the Secret Trail (aka the Calabasas-Cold Creek Trail) and wind our way through shaded ravines, dense chaparral and sandstone outcrops until we reach Calabasas Peak Motorway. Here we throw away the hiking book (I lose so many books this way) and instead of taking the Motorway to Calabasas Peak, we’ll go off-trail along some use trails. We’ll not only bag the peak, but we’ll also circumnavigate it along an old overgrown trail. 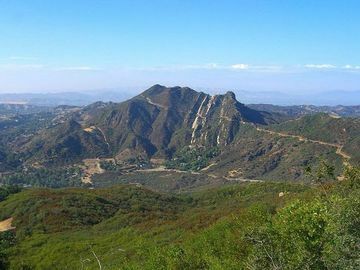 Calabasas Peak (2163 ft) towers over Red Rock Canyon, Old Topanga Canyon and bowl-shaped Cold Creek Canyon. 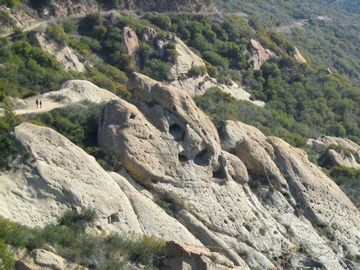 From the top there are spectacular views into Ventura County, the Pacific Ocean and San Fernando and Simi valleys. Hike is usually a strenuous 4.7 miles with about 1,200 feet total gain. I’m going to kick it up a notch with a side trip that will add about a mile; this part may be also be a little overgrown. From the 101 freeway in Agoura/Calabasas, head South on Las Virgenes Road to Mulholland Hwy. Turn Left on Mulholland and continue 5.7 miles to a small parking area on the right. or…. From 101 Ventura Fwy in the Vally: take Valley Circle/Mulholland Dr exit south, turn right on Valmar Rd (becomes Old Topanga Cyn Rd) then right on Mulholland Hwy 2.1 miles to the parking area on the left. Bring at least 2 qts water, snacks, sunscreen. The Organizers and members of Hiking With Dean are not professional leaders, guides, or mountaineers. The function of the member or organizer is only to organize the trip. Each person who shows up for a trip/meetup (and their guest or guests) is responsible for his or her own safety. 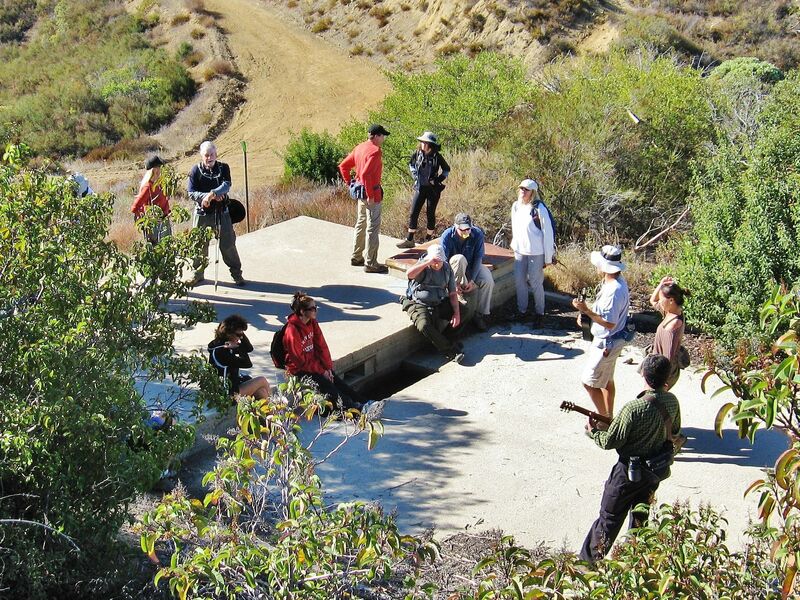 By attending a hike, or any other event organized by this group, you are acknowledging that you and any guests that you bring are aware of the risks, dangers and hazards associated with the activity and freely accept and fully assume all such risks, dangers and hazards, and further agree to release and discharge the Organizers, Members of the Hiking With Dean Meetup Group from and against any and all liability arising from your participation in the group activities per our ASSUMPTION OF RISK AND LIABILITY WAIVER and Section 6.2 of the Meetup.com Terms of Service.